In rugby they combine the aspects of football and soccer to create the toughest team sport on earth. Man Versus Machine – For starters, here you have some of the toughest blokes ready to face head to head with the thrice F1 racing champ Daniel Ricciardo. Talk about a will of champions. Nothing will stop either of these sides from shouldering ahead to the front of the pack. Figuring out just how hard a rugby team can go against one of the quickest machines on the roads is awe inspiring. Talk about transforming the old school activity of tug-o-war. Champions for the Win – Whether or not the Pirelli tires take the win in this championship match of rugby guys against a F1 car, the greatest thrill is in seeing the match. Choosing a winner is one aspect of this battle. However, the most impressive feat is in the challenge itself. When placing these two upper level champions, each in their perspective sports, head to head in a scrum like no other, it’s sure to get your blood rushing. Seeing these manly players dig in deep and push against this Formula One race car with its 750 horsepower is amazing. The tires burn on blacktop, the grass gets dug down to the roots, and both sides put on their best faces. In the end it’s all a game of good sports and good will with both sides coming out to show appreciation for one another. What’s next? Are we going to see rugby players scrum against robots ready to take them down? What about sport against sport? I’m sure there’s quite a few football and soccer teams that would be all up for trying their skill and testing their power against this rock hard and studded rugby team. Taking the world by storm, this new and improved form of old school tugging contests battles muscle against muscle in a toe to toe battle for the ages. Speak your mind. Who would you like to see go head to head in a scrum with the Bath Rugby club team? 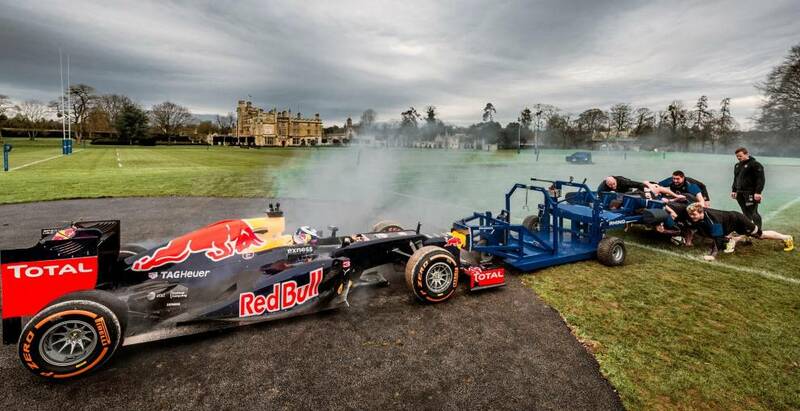 Can you top the Formula One racing car battle royale, or is this as good as it gets?